Kate Feldman (MSW, LCSW) specializes in helping couples and individuals create powerful and satisfying relationships. She holds an MSW from Smith School for Social work and is a certified Imago relationship therapist, as well as certified in Gestalt therapy. She was a founding member of Kripalu Center for Yoga and Health, beginning in the early 1970s, and lived, worked and raised a family there from 1973 until 1995. 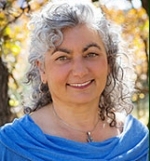 In 1994 she and her husband Joel founded The Conscious Relationships Institute™. This educational institute provides training workshops and seminars, marriage counseling intensive retreats, and psychotherapy to individuals, couples, and families. Over the last 30 years, Kate and Joel have developed uplifting and educational training programs for couples. These are offered at Kripalu Center, Omega Institute, and in the southwest United States. Additionally, she has created and led other workshops and trainings on relationships, personal growth, yoga, holistic health, leadership, and counseling. Kate is also certified as a Gestalt Equine Psychotherapist, and offers private equine retreats for individuals as well as groups of helping professionals on her ranch in southern Colorado. For more information please see these two websites: The Conscious Relationships Institute and Durango Equine Therapy. When we learn to treat others with relational skillfulness, we are practicing yoga. The ultimate goal of Yoga is union—union with the divine essence in ourselves and in the world around us. Like a wave in the great ocean of existence, human beings have the capacity to melt our sense of separateness and experience oneness with everything and everyone. This is the true essence of yoga. Learning to see the divine essence in another human being, even when our human reactions, idiosyncrasies, and differences are staring us hard in the face, is the practice of The Yoga Of Relationships. It will gift you with the deepest experience of loving: that of connecting with another person at the level of soul. We call this spiritual intimacy, because it includes the experience of transcendence and oneness through the experience of deep authentic connection with your loved one. I have seen over and over again, when two people want to love and be loved, and when they are willing to grow and change, something mighty emerges. Both individuals grow and become more of who they uniquely are. The partnership provides support, comfort, intimacy, teamwork and abundance. By developing the Yoga of Relationships, that is, approaching the challenges of our relationships as an invitation to personal and spiritual growth, and by developing the capacity to skillfully and consciously love each other and our children, we can end the age-old cycle of generational wounding and contribute our share to create greater harmony in our families, communities, nations, and our global family. Check out other similar posts in the Health, Relationships category.